I have no idea who these people are, but this short video of their bulldog lounging on a chair during their camping trip made me laugh out loud. We're going camping this weekend (finally! ), but we're leaving the dogs home. Trying to keep up with a 1 1/2 year-old in the woods is challenging enough without having to chase the dogs around, too. Our dogs are not nearly as mellow as these two. I wrote a story this week about how college students are using Facebook — specifically, I profiled a delightful Jordanian junior at Middlebury who is voluntarily providing info and advice to incoming freshman. I've spent a lot of time this week on Facebook as a result. I have to admit, I'm finding it both useful and fascinating. I'm surprised that more Vermont media folks aren't on there. So I was excited just now when I got a friend request from Ethan DezoteIle, the editor of the County Courier. It got me thinking that we ought to have a Vermont media group on Facebook. "For Vermont media professionals and others interested in sharing thoughts about the internet, social media and the state of local journalism." This one's actually not from Vermont, but I couldn't resist. A video clip from the Miss Teen USA pageant, in which Miss South Carolina gropes for an answer to the the question: Why can't 1/5 of Americans find our country on a map? UPDATE: A witty video response. Thanks, Sky! UPDATE II: Ha! Miss S.C. got so much attention that the Today show invited her to try again. Her new response? "Well personally, my friends and I, we know exactly where the United States is on our map. I don't know anyone else who doesn't. And if the statistics are correct, I believe there should be more emphasis on geography." Not as much fun as the first answer. An incredible story of love and murder in the IM age, from Wired. At The Roanoke (Va.) Times, editors noted that readers are not always that interested in what their fellow readers are saying, at least not on a regular basis. Online Editor John Jackson set up 10 online columns by local residents in 2003, finding maybe three got any real reaction. "They weren't writing about things that a whole lot of people were interested in," he says, citing a graphic artist who described life in that job. "One guy wrote about stuff he saw on the side of the road, and he would hand-write it and we would scan it in." • Curious about iPhone usage in Vermont? Doug Cadmus of Bloggle offers a comprehensive, link-filled blog post addressing the matter. I still haven't seen one of the suckers. 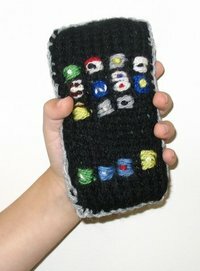 This image shows a knitted iPhone from this guy's blog. • Rebecca Grannis and Chapin Spencer of Local Motion have set up a survey kiosk on the Burlington bike path. They pose questions and invite people who pass by to write down answers and put them in a box. Every so often, they post the answers on the Burlington Bike Path Speak blog. This month's question: "What is your most embarrassing moment?" --I crashed into the bagel store in Shelburne two years ago! --Tired from shopping I walked into a 3-way mirror and said "Oh, excuse me, I'm sorry" to myself! • Who's blogging about social media (Facebook, Twitter, Flickr, etc.) in Vermont? Dan York, Elaine Young, Meredith Farkas, Jessamyn West, Morgan Aldridge... If I were to compile a comprehensive list, who would I include? I'm looking for people who write often about social media tools. Feel free to suggest sites you like. • Catblogging — Is this person for real? I just don't understand how someone could be that into a cat. Sorry, cat people. • Speaking of furry animals, Don't kill the hampster! [sic] Very funny. From My Innermost Thoughts Gone Public. • Happy Birthday S.R. Wild! • The Champlain College Library's website has been named College Library Website of the Month, according to The Sheck Spot. • Undead Molly and the Mystery Vanity Plate. What the heck does it mean? • You Just Paid 80K to Teach George W. Bush A Good Lesson About Respecting Our Inalienable Right to Wear Blunt T-Shirts from — who else? — Philip Baruth. 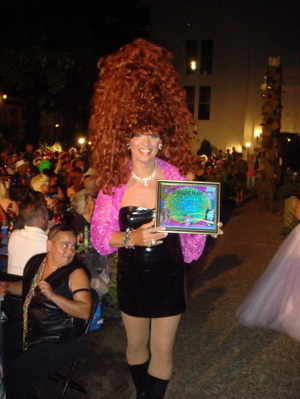 Vermont Drag Queen Wins Award for "Biggest Hair"
Lucy Belle LeMay of the Hot Damn Trailer Park in the fictitious town of Beaver Pond, Vermont, was at the Provincetown Carnival last week, where she competed for the title of Biggest Hair. She won in 2002, 2003, and 2004, but came back empty-handed the past two years. This year, her luck changed. The email, from "Amber LeMay," aka Bob Bolyard, adds, "Lucy Belle would like to thank Ron and Don at the O'm Salon in Burlington for assisting with her hair presentation." Whoever helped her definitely deserves some credit. 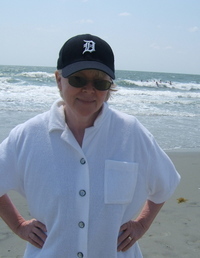 You can read Lucy Belle's P-town diary at the House of LeMay blog. And there's more info about the "ladies" LeMay in this story I wrote last year. This photo was taken by Russell Dreher. Free 12 inch Oscar to a good home, or a bad home, whatever, as long as you have a home for it just take it home with you. Thats right!! A Fish! And it's free too! No money down. No credit? Bad Credit? Come and get it! You can find it at The Outdoor Gear Exchange in sunny downtown Burlington. Bring a bucket or a bag, just don't plan on sticking it in your pocket cause it bites. There is only one so act fast.